Millie Wuhrmann joined a large rambunctious family when her mother married widower Earl Yoho. As a result of the marriage, she suddenly went from being an only child to one of seven children. Of all of her siblings, she and her sister Neoma were very close. They attended nursing school together and later were roommates when the two worked as private nurses in Indianapolis and Chicago. When WWII broke out, they had wanted to join the Army. At the request of their father, who did not want them sent overseas, they postponed their enlistment. 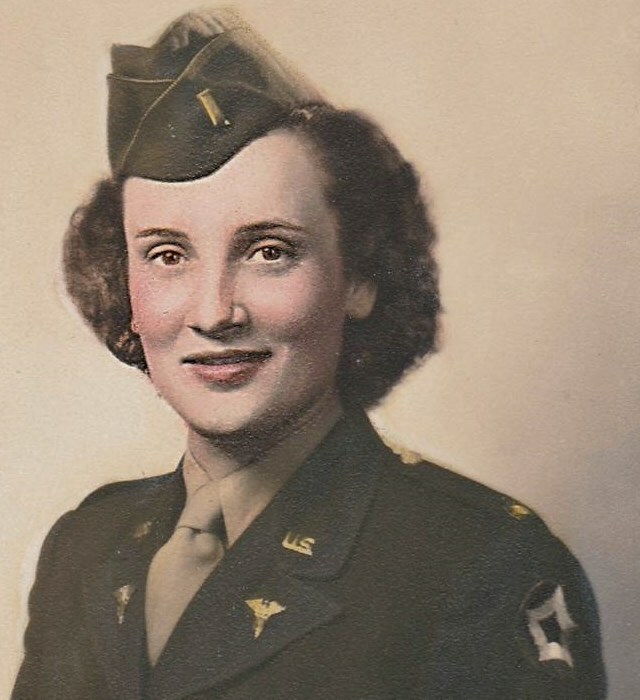 After their father died in 1944, the Army again put out a call for nurses. The two sisters joined the Army Nurses Corp with the understanding they would be stationed together. While they were stationed at Lettermen Army Hospital in San Francisco, Millie met her future husband, "Mike" Wuhrmann. Mike and Millie were married in June, 1948. Three years later, Mike was transferred Anchorage, Alaska. They made the journey north, pulling a trailer with their belongings, along with their infant daughter, Karla, along the rough and primitive Alcan highway. It was in Alaska that they would welcome their second daughter, Mary Jo. Several years later, while stationed in Wisconsin, Mike passed away. His wish was for Millie and their daughters to live near family. By that time Millie's sister was established in Lakewood, and Millie's mother was close by on Ashworth St. Millie moved with her daughters to Lakewood, and purchased the home next door to Neoma. Millie was proud to have served her country during WWII and always had a special place in her heart for those in the "Service". She returned to nursing, and when the Naval Hospital in Long Beach opened, she started working there at one of the family clinics. She continued to provide care for the members of the country's armed forces, only this time as a civilian. Millie lived in Lakewood for over two decades and saw both of her daughters graduate college and have careers. She and her sister, Neoma Miller, remained close and at family gatherings could be found telling stories of their time in the Army. Millie lived in Lakewood for over 2 decades, arriving in 1958 as a young mother with two small children. She worked as a civilian nurse at the Naval Hospital in Long Beach from it's opening until her retirement.